‘Why didn’t I think of that play on words?’, is the first thing I thought upon reading the title, but when I perused the insides, I realised I couldn’t have done it better myself. This is a captivating and entrancing picture book – the sort a child treasures and rereads. Little Red Reading Hood loves books and in a twist, doesn’t visit her grandma, but rather, the library. When Little Red Reading Hood and the tenacious librarian impress the wolf with their literary knowledge and analysis, the wolf turns to stories instead of eating people. The twist here, is that instead of straying from the physical path through the woods, it’s better to stray from the all-too-predictable ending of a story, and instead, reinvent it. The story is told in rhyme, with pitch perfect rhythm, but it’s also the little touches that enhance this picture book so wonderfully. 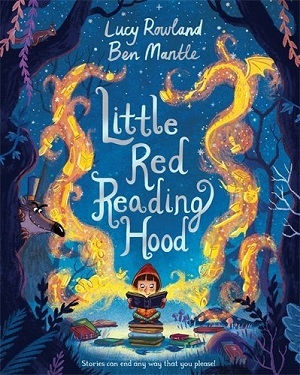 From the endpapers with Little Red Reading and the wolf having fun mixing up fairy stories, to the beautiful ethereal golden-hued illustrated imagination that soars through the book, to the nature depicted in the woods. This is a fabulous new picture book and my top choice. You can buy it here. The Pirates Next Door is an immensely popular read, and this sequel keeps equal pace and humour with the original. In fact, just one reading of it inspired my little tester to find and read ALL of Duddle’s back catalogue. This time round, Matilda is going on holiday with her pirate friends, the Jolly-Rogers. 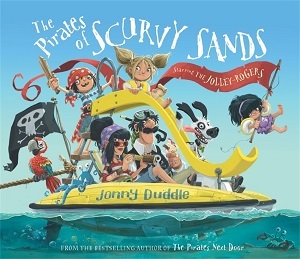 Their destination – Scurvy Sands – like a sort of Butlins for pirates. The only trouble is that Matilda, with her squeaky clean demeanour, doesn’t quite fit in. This is a totally luscious affair for pirate fans. Also told in rhyme, it’s simply packed with swashbuckling vocabulary and pirate allusions, with a busy backdrop on every page – telescopes, pirate paraphernalia, characters and more. Duddle has gone to town (or sea) and had lots of fun in the process. There’s even a treasure map on the reverse of the book jacket. Gold coins all round. You can buy it here. For younger children comes this exquisitely illustrated lesson on getting on with others. 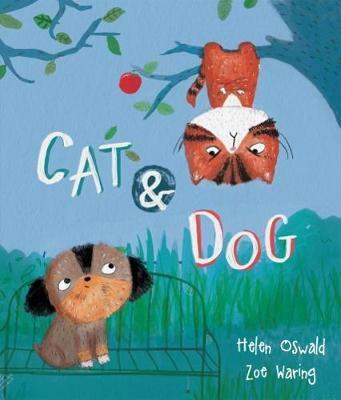 A nocturnal cat and a diurnal dog love to scrap, but when they fail to see eye to eye on their different routines, and Dog insults Cat, it looks like a beautiful friendship is over. By the end, of course, they learn to say sorry and accept each other’s differences. It’s the illustrations in this simple story that bring it to life, two hugely endearing and familiar animals, drawn so that they look good enough to stroke. The crayon-led illustrations add to the familiarity of the chosen pets, and the last page of their ‘scrapping’ together is a clever childish mess. Too cute to miss, this is a lovely publication from new publisher on the block, Willow Tree Books. You can buy it here. 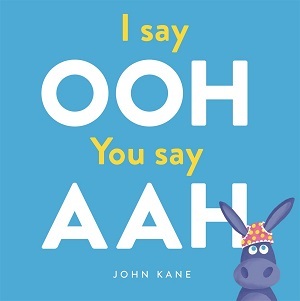 One for reading out loud to a willing audience, this reminded me of those old-time party entertainers, but here, the silliness is executed with modern panache and an element of complete childhood joy. This is a traditional call and response book – the author asks the reader to say or do something every time they read or see something. The result has an hilarious effect, leading to the children shouting underpants quite often. The reader has also to remember which action goes with which command, so it’s stimulating too. Great for classroom fun, and the colours are bold, bright and all-encompassing. The author used to work in advertising – and it shows in the block colours – easy to look at, easy to understand. You can buy it here. It’s often remarked how translated fiction can go further and push more boundaries than our home-grown picture books, but here’s one that takes the ten protagonists and really gives them a raw (cooked) deal. 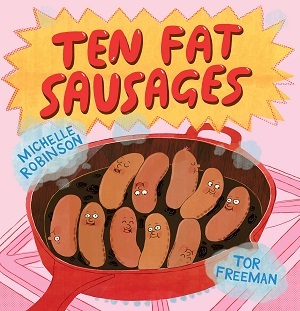 A play on the song, Ten Fat Sausages Sizzling in a Pan, here Michelle Robinson shows what happens when they try to save themselves. Unfortunately, sausages don’t appear to be very clever. Whether it’s leaping from the pan into the blender, or even into a ceiling fan, it seems that no sausage is safe. The illustrations from Tor Freeman match the madness of the concept – from blueberries with their eyes covered, to weeping sausages, hoola hooping onion rings, and an almost retro comic feel to the lot – this is a crazy sausage adventure. Sure to bring out the giggles in little ones. You can buy it here. Being a mum, and having a great mum myself, I’m always touched by the portrayal of fabulous mothers in picture books – be it giving Sophie a fabulous tea when the tiger arrives, or returning to the Owl Babies at the end of the night. 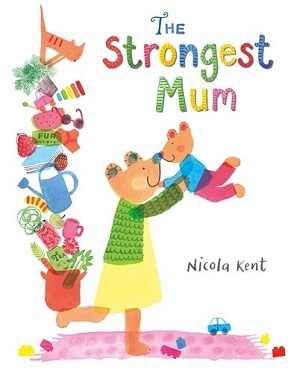 The mum in this delightfully sweet picture book amasses belongings and carries them all as if she were weightlifting for England. Dealing with a familiar issue (carrying everything!) – and why giving up the buggy too early and having to schlep all the shopping by hand can be a mistake – this is a wonderfully exaggerated portrayal of a super mum. From carrying some treasure found in the garden at the beginning, Little Bear’s Mum ends up carrying everything including Zebra’s shopping, Lion’s laundry, and then…a piano. It all comes crashing down though, and Little Bear realises he has to help. The illustrations are undeniably child-friendly, in a multitude of jewel colours, with an aerial view of Mum’s bag, each item labelled! With oodles of white space, the book doesn’t feel slight because every illustration is packed with texture, pattern and colour, despite a slight transparency to it all. An intriguing new style and a good pick for Mother’s Day. You can buy it here. Another for a slightly younger readership, giving a moral story, this encourages children to share. Lionel the Lion is bigger than most of his friends, and good at snatching. So whenever they see something they want, Lionel always gets there first. When Lionel goes a bit too far at Chloe the Cat’s birthday party, he realises that he’s angry and sad, and needs friends most. Sharing is best. 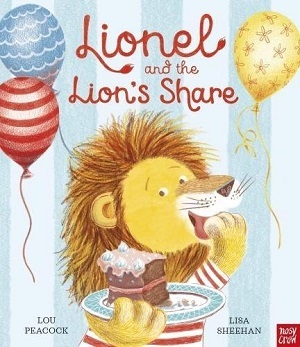 Drawn with tender pencil strokes, Lionel himself is phenomenally vibrant, with a large orange and brown mane, and his animal friends are equally detailed. They are vastly anthropomorphised with clothes as well as human behaviours, but it is the colourfulness and fun of the backgrounds that enhance this picture book. A detailed musical instrument shop, a hat shop, and the village green – this storybook world looks timeless and appealing. You can buy it here. 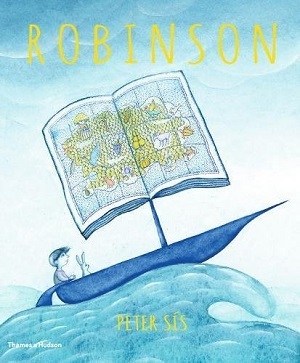 A bit of a love letter to Robinson Crusoe, this picture book takes a look at the meaning of being bullied for liking something different, and also a whimsical approach to solitariness. It also shows what happens when a child or adult finds inspiration, solace and adventure in a storybook and use it within their own lives. In fact, author Peter Sis researched the flora and fauna of Martinique, the inspirational island behind Defoe’s novel, and used his knowledge to illustrate the book. Sis’s fine art background gives some insight into the illustrations in these structured and intriguing pictures. He plays with point of view and light and shadow to create an utterly unique look to the book. The colour palette tells the plot just as much as the narrative itself. Typeset in uppercase letters, the whole book feels like a stream of consciousness, a message in a bottle, as the colours blossom and bloom with the boy’s discovery of his own island in the imagination. The book aims to deliver a paean to the act of adventuring and exploration, even that which happens in the mind rather than in actuality. A great discovery. You can buy it here. Last, but definitely not least, if you’re wondering how all those authors and illustrators featured so far produced their books, then you’d best read My Worst Book Ever. 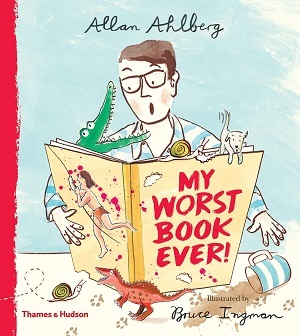 Allan Ahlberg and Bruce Ingman are no strangers to the picture book trade, and here they’ve created a humorous look at what can go wrong when writing a book. A classic book within a book scenario, as Ahlberg explores how he is writing a picture book about crocodiles, the text of which is hinted at within this book, but then things start to go wrong – the illustrator has different ideas, as does the publisher, and then a naughty girl at the printers messes it up even further. Added to this are all the various procrastinations that writers bow to – distractions out the window, family interruptions etc. For children this is a fun and humorous look at the publishing trade. For writers, it’s a mirror. Illustrated cheerfully, this will bring a wry smile to many a face. You can buy it here. What makes a good picture book? It’s a question that plagues writers, illustrators and publishers of course. Unlike a novel, where it might take me some time to work out if I’m going to review it favourably and what it is that grabs me, with picture books that drop through my post box, it tends to be an instantaneous reaction. Is it the concept, the re-readability, the illustrations, the characters, the rhythm, the humour? Whatever magic wielded here by experienced writer and illustrator duo Ahlberg and Ingman, this picture book worked from the moment I saw the cover. 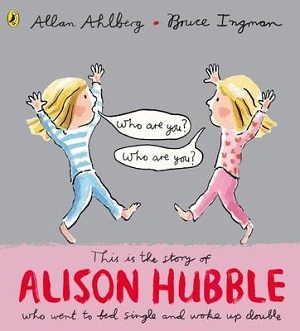 The concept of Alison Hubble is, in itself, fairly genius – partly because the concept feeds into the rhythm of the book – the two are inseparable, full title being: This is the story of Alison Hubble who went to bed single and woke up double. I can’t resist a rhyming picture book – they are a pleasure to read aloud and enable the listener or reader to guess what is coming next with ease. There is fun too, with the illustrations showing Alison’s delight at what has occurred and then the slight doubt as the two Alisons squabble over who is really Alison. But then, to the reader’s surprise, Ahlberg takes his joke to the next level by doubling Alison again…and again. And then it becomes as much a book about numbers and maths as it does about humour, fun, and cleverness. Ingman is also let loose – with his subtle drawings of multiple Alisons and her environment, especially when multiple Alisons set off and off and off etc for school – each Alison the same and yet dressed slightly differently, and then answering the register call at school from all over the classroom. His illustrations are reminiscent of those in The Pencil, where the world grew exponentially during the story, in the same way that Alison grows (in an unusual way) here. There is so much detail to take in on each page – from the other schoolchildren gawping at Alisons, to the cut-through of her house, and of course the many many Alisons, all the same and yet individuals too – and it is this subtle rendering of ‘clones’ all with their own personalities, that makes the book so clever, and so interesting. Ahlberg has great fun with the ending too, along the way involving press, football team analogies and the hilarious despair of her parents. It’s all rather amusing. And clever at the same time – Alison does her doubling wrong, and the reader must spot the mathematical error – and there is a cheeky school boy who answers to Alison’s name too, as well as some funny placards, and more play on words with newspaper headlines. The last double page illustration is ripe for counting Alisons – my test child readers all did this – before demanding re-reads. A new classic – a brilliantly tongue-in-cheek and smart picture book.